Ed note: Fox News host Shep Smith shut down French politician Philippe Karsenty, who suggested that the Notre Dame fire wasn’t an accident. Smith said speculation about “conspiracy theories” was wrong and “those who entertain them are not acting in the best interests of the people of this planet.” Yet in Ian Fleming’s novel Goldfinger, the eponymous villain says, “Mr Bond, they have a saying in Chicago: ‘Once is happenstance. Twice is coincidence. The third time it’s enemy action. 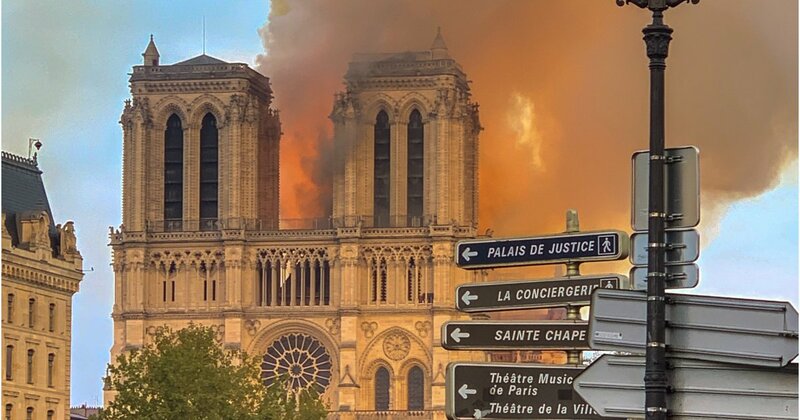 '” Given the large number of church burnings and desecrations currently taking place in France, it is reasonable to ask whether the inferno that engulfed the historic Notre Dame Cathedral was really an accident as it is being portrayed. …that’s what they tell us. Emphasis on words “likely” and “probably” and “accident”. Does anyone with even a mediocre sense of reality and relative common sense expect the French authorities to actually cough up the name (or names) of people responsible for the fire? Does anyone actually expect Macron to divulge who is responsible for the inferno…? If you do…we’d like to officially welcome you back from the moon. Hope that head injury from falling back to earth isn’t too permanent. The Church is an iconic symbol of Christianity. For millions, an arson attack on the Church represents nothing short of an act of war on The Son Religion. Does anyone really think that Macron will ever reveal who set the fire…? No matter what the investigators find out, it will always be a “likely probable accident of restoration” to the public. Translation: “some people did something”. Will the French media connect this horror to the March 17th burst of flames at the second largest church, Saint-Sulpice, on March 17? Will the French government admit a spree of vandalism against 10 Catholic churches across France that sparked fears of a fresh wave of anti-Christian sentiment in the country? Will the French authorities speak of arrests of 3 Muslim women who were preparing an attack on Notre Dame in 2016 by packing a car with gas cylinders left near the famous Church? For the exactly the same reason: releasing the incendiary “JFK Affair” details would’ve sparked World War III at a time when Cold War tensions were heightened. …the rest you can speculate yourself. Final thought: does it seem a bit odd that terrorism was ruled out within a few hours of the blaze? The French are a gifted lot, they need to share some of this miraculous investigative efficiency with the rest of the world soon. In the meantime, enjoy tweets of joy from ISIS and Islamists at this turn of events. “Allah est grand”, Mohamed Mouara commented at the sight yesterday. YouTube, Twitter and Facebook are ablaze with similar sentiment. The Qur’an suggests that the destroyed remnants of ancient non-Muslim civilizations are a sign of Allah’s punishment of those who rejected the “truth”: “Many were the Ways of Life that have passed away before you: travel through the earth, and see what was the end of those who rejected Truth.” (3:137). Let the Islamic celebrations begin. Valerie Sobel is an Economist, pianist and writer residing in Canada.